Lovers of 70’s funk music, classic slots and bright colours will fall head over heels for NetENT’s Twin Spin slot. This classic, yet modern video slot comes with 243 ways to win, wild substitutions and a Twin Reel feature. The slot takes you on a retro ride back to the future by mixing the old with the modern. The Twin Reel future is guaranteed to turn your rags into riches once triggered. Twin Spin comes with funky tunes, colourful designs and entertaining gameplay to entertain all senses simultaneously. The slot provides lucrative wins of up to 270,000 coins per spin! 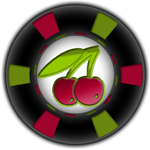 It is playable from as little as 0.1 coins per bet line to a maximum of 0.50. By playing at a minimum of 25 coins per spin players could easily keep spinning without worrying about their bankroll. Twin Spin can be enjoyed without a glitch on all devices from desktop to mobile and tablets. Play the slot at maximum volume as you don’t want to miss out on a ride to funk town. Twin Spin is another NetENT classic you don’t want to miss out on. It’s got great beats, winning spins and a bonus feature worth waiting for. Normally classic slots lack in the bonus feature department, luckily Twin Spin is an exception to the norm. Of course, we’d want there to be more features available but sometimes less can be more. 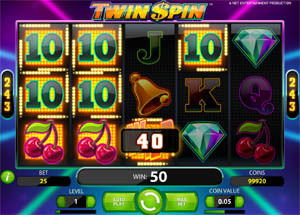 Twin Spins offers 243 ways to win, wild substitutions and of course the fabulous Twin Reel Feature. The 243 ways to win is incorporated into the gameplay. Thus, each spin will give you up to 243 chances of winning. It’s not essential but it’s always an added bonus to have your odds increased. It would be advised to keep your line bet relatively low to keep from running on empty too quickly. The 243 ways to win gameplay is also used in other slot machines like Thunderstruck II, Basic Instinct and Immortal Romance. The slot comes with a bright multi-coloured wild symbol that substitutes for all other symbols. The Wild alone breaks away from the classic feel of the game. Classic slots are known to have no bonus features, only high-value symbols. 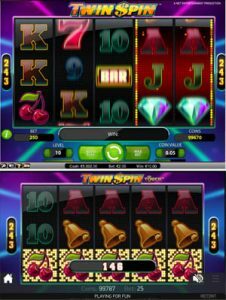 With Twin Spin, you can look forward to great winning combinations formed with the help of a wild or two. The Twin Reel feature takes place during the main game. Each spin starts with identical, adjacent twin reels linked together. It becomes even more exciting when the twin reels expand into triplet, quadruplet or even quintuplet reels during a spin. The twin reels can appear anywhere on the reels at the start of each spin and will always remain adjacent. It might not seem like much but when all 5 your reels are “twinning” you’ll be smiling all the way to the bank. The highest value symbol is the Diamond and 5 of these could get you 1,000x your line bet. Twin Spin is unique as it comes with a little bit of this and a little bit of that. While it continues to be a modern game it contains elements from the past. Symbols like the Bar, Bell and 7 are iconic classic slot symbols that make their appearance on your reels. Players will also get to enjoy a blast from the blast with the funky 70’s soundtrack. 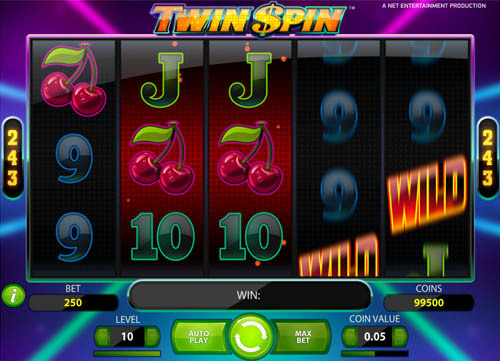 At first glance, Twin Spin reminds one a lot of Neon Staxx, another slot powered by NetENT. Both these slots have beautifully, bright backdrops of blue and purple and neon coloured symbols. The highest value symbols of this slot include a diamond, a 7, a bar, a bell and a cherry. The lower value symbols are made up out of the classic card symbols A, K, Q, J, 10 and 9. The Wild is big and bold and extremely hard to miss while the Twin Reels brighten up your reels with each spin. If you enjoyed Starburst and Neon Staxx then Twin Spin comes highly recommended. Players will be delighted to hear that this neon coloured classic is available on all mobile and tablet devices. The HTML5 software allows players to get the same experience on their mobile devices as on their desktop. The slot runs smoothly without any glitches almost as if it was made to be enjoyed exclusively on mobile. Be sure to carry your headphones with you for the funky tunes accompanying the gameplay. As always not much changes except for the placement of the betting buttons but that’s for your comfort. Get in on the Twin Reel action on the go, whether you’re on lunch, on holiday or on your way home. NetENT is known for creating classic slots with a twist. Twin Spin is another fantastic example of their ability to turn boring into a masterpiece. Don’t be discouraged by the classic symbols on the reels. They are simply a reminder of how far we’ve come. The Twin Reel Feature will kick your winnings into high gear and make you forget about the old and focus on the new. The upbeat soundtrack will keep your ears entertained while your eyes are stuck on the reels. Whether you play on your desktop, your mobile or tablet device, Twin Spin is the game to try. It brightens up your screen, energises your soul and could possibly fill up your bankroll. With up to 270,000 coins up for grabs per spin, there’s no telling how much you could win. Those looking for more excitement and bonus features should try out Jack and the Beanstalk or a rock classic like Guns ‘n Roses video slot. Especially try Guns ‘n Roses if you enjoyed the musical aspect of Twin Spin. It’s not every day you get to play a slot that incorporates your favourite songs from an iconic rock band.